Consumer beliefs about urban etiquette need changing according to traffic planners and transit specialists. In 2007 the TTC removed signs encouraging pedestrians to stand-right and walk-left in the subway system. Escalators date back to 1900. Canada’s first escalator, made of wood, first appeared four years later in a Toronto department store. Soon after escalators were part of the London subway system. 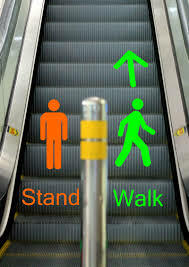 Escalator etiquette since this time has been to stand on the right and allow others to pass on the left. While this makes intuitive sense there are attempts around the world to change this thinking. Early in 2017 the Nanjing, China subway system commenced a campaign to change standard escalator behaviour. Escalator etiquette results in equipment wearing unevenly. The Nanjing Metro announced that “About 95 per cent of the escalators have severe damage on the right side”. They no longer advise to stand on the right and allow others to pass on the left. The same conclusion occurred in Britain. 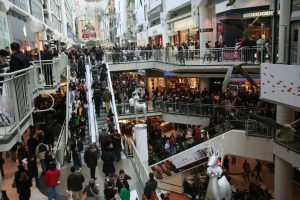 The London Tube has determined that standing on both sides of an escalator can allow for a possible 30 percent increase in capacity. Japan came to a similar conclusion and implemented a campaign to change consumer behaviour in 2014. Not everyone is comfortable with this change. Many are concerned about appearing rude by not allowing others to pass. A similar problem exists for traffic planners when it comes to road construction. Most drivers merge into open lanes well before a lane disappears. Traffic planners recommend merging as late as possible to make full use of available space. Research suggests this can reduce congestion by as much as 40 percent. Many drivers, perceiving this as rude and inappropriate behaviour, do not allow late mergers to cut in. The Alberta Motor Vehicle Association (AMA) is seeking to improve travel times through their “It’s OK to cheat – in fact AMA encourages it!” campaign. In the case of escalator traffic and vehicle merging, the view of planners does not coincide with our beliefs on fairness and proper etiquette. The increasing urbanization of our city will require some changes.